The Fein Multimaster has been around for years and it was not uncommon to see one on a jobsite every once in a while. They have been a popular tool to those who could afford them, yet seem an unnecessary tool to those of us who had never before used one. Of course that all changed when every brand in the world started making them after Fein's patent exclusivity ended. Now in an effort to keep the cash coming in, Fein has launched a new consumer package for their FMM 250Q. With the introduction of so many competing oscillation tools these last few years, there is no doubt that Fein has lost a large percentage of the market. So how does Fein regain some ground? Target their product to consumers, who's numbers abound. 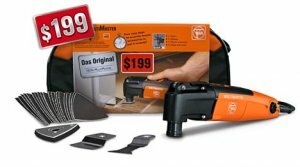 A new FMM 250Q consumer package is being offered by Fein that costs $199, far less than their other packages. This new consumer package cost much less because it offers a cheaper soft carrying case and has fewer accessories that better match consumer's need to do basic cutting, scraping, and sanding tasks. The FMM 250Q should not be confused with the FMM 250, which lacks the quick accessory change feature.